Article from Living Design Magazine. 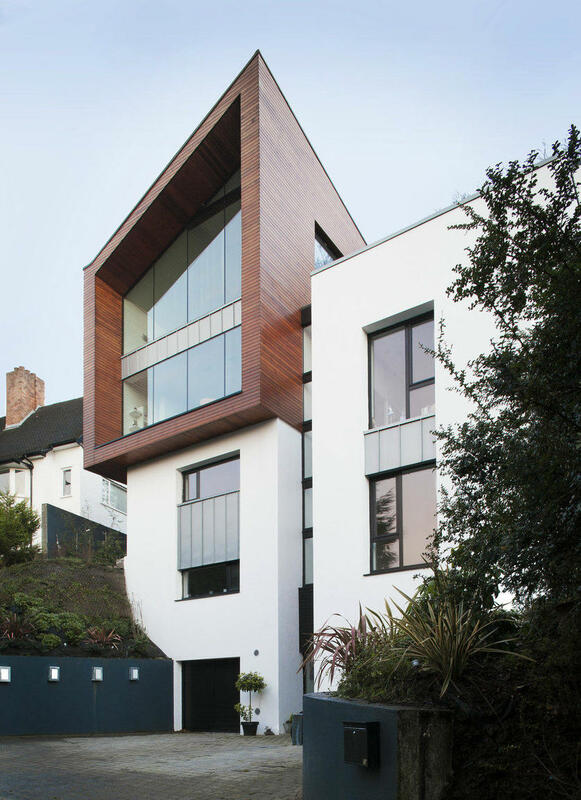 Living Design delve into BGA Architect's familiy home, which is nestled into a hillside in Holywood, County Down. 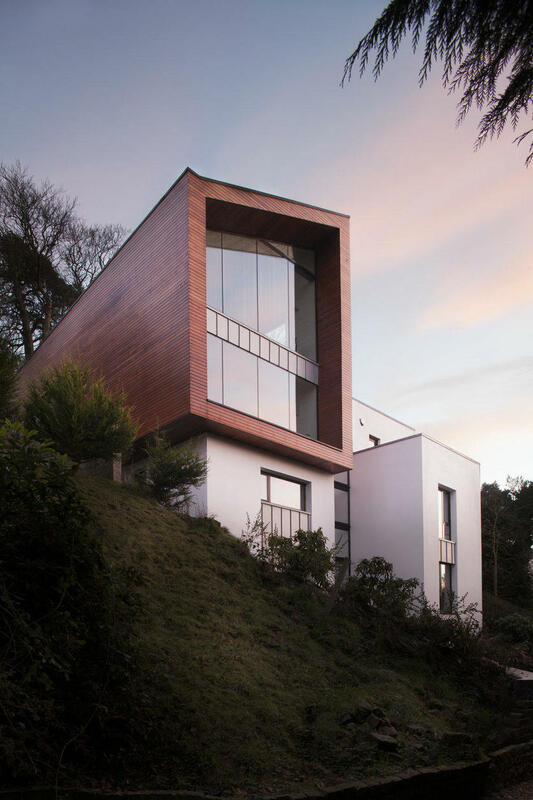 Nestled into a hillside site, this house in Holywood, Co.Down, is both bold and clever, making the most of every possible opportunity which the site offers. 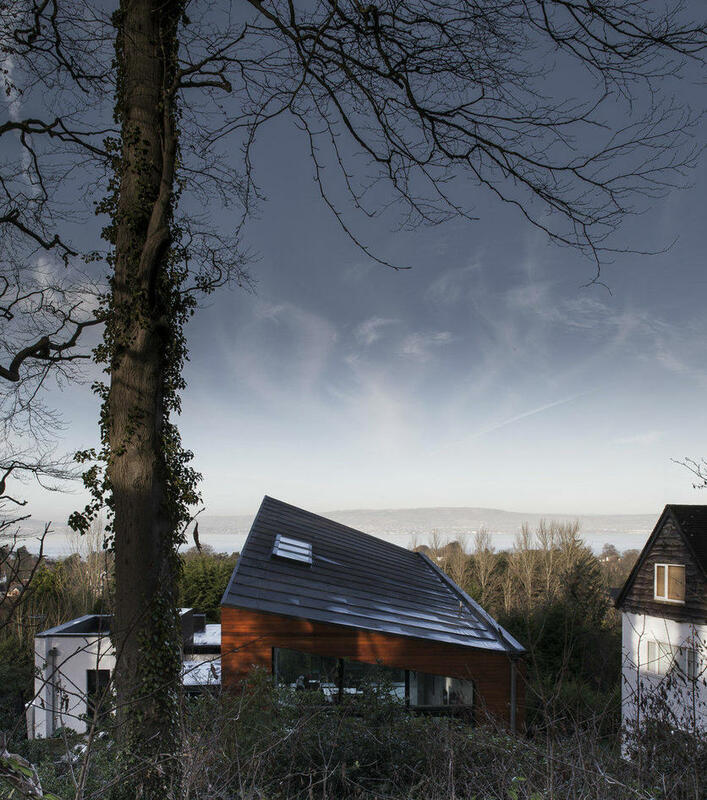 Its principal achievements are in the creation of a variety of unexpectedly rewarding internal and external spaces, and extraordinary elevated views – in the architect’s conception an ‘eye’ on the world below, which is the dramatic sweep of almost unbroken trees and greenery to the waters of Belfast Lough and across to the Co. Antrim landscape opposite. In fact, the footprint of the site is not large. Situated off a short private lane, tucked between other houses, the plot is comparatively narrow. 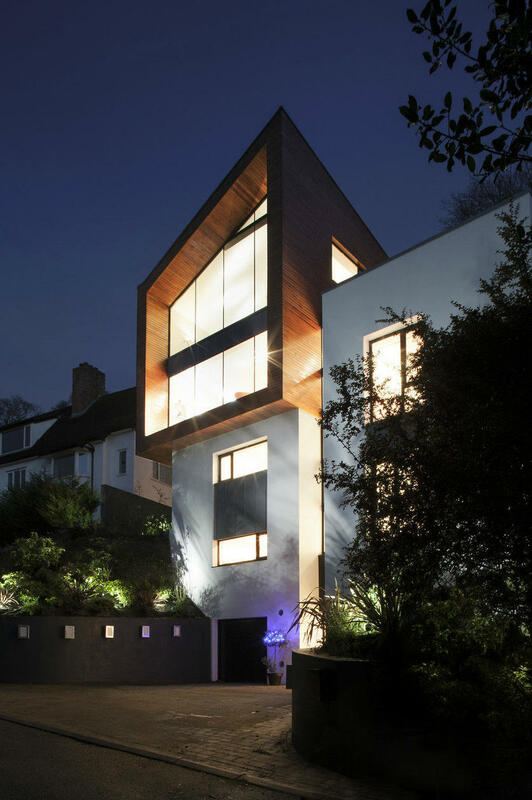 The house, dug into the steep hillside, uses the most of the width and depth of the plot, but the emphasis of the structure is primarily vertical. Sweeping retaining walls open up a paved forecourt at ground level leading to the main entrance, which is a central doorway at the base of a link section between two sides of the main house. 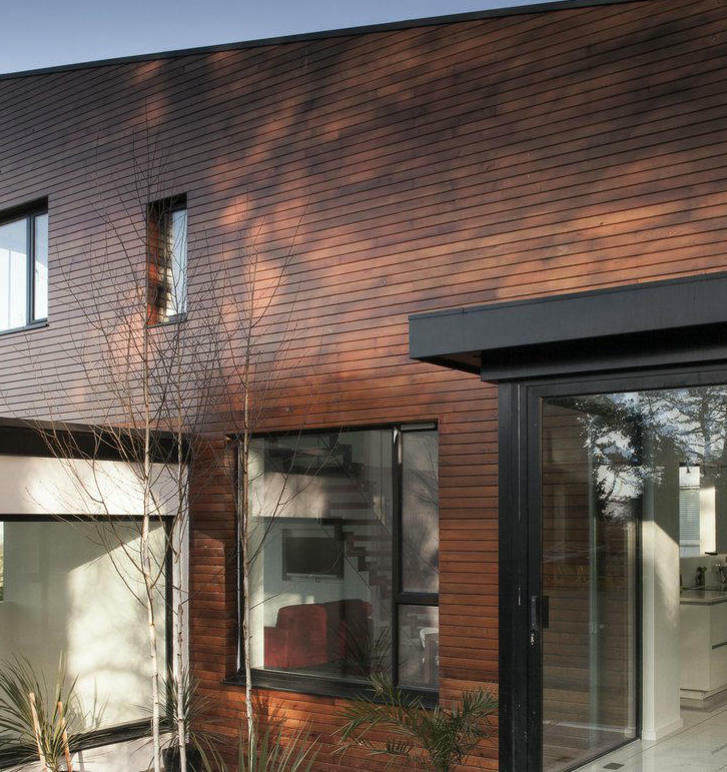 The front elevation faces north and uses a mix of contrasting materials: white render, standing seam zinc panels, cedar cladding and timber window frames stained black. 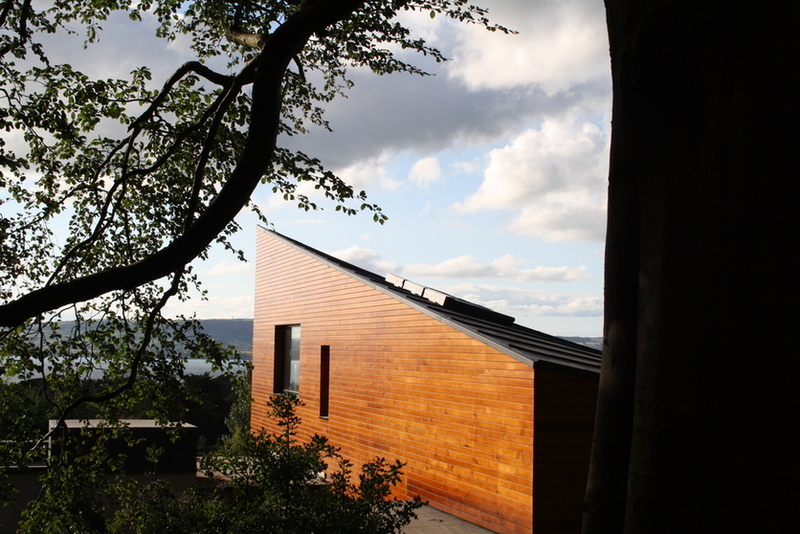 The house is, conceptually, composed of two distinct elements: a main ‘core’ which is the solid, heavy anchor of the house deep rooted into the hillside, and an ‘eye box’, a dynamic, lightweight floating element projecting from the core, both a visual statement in itself and structurally designed to avail of the panoramic views. Inside the core element, it is immediately apparent that the house works its way up to the dramatic spaces rather than seeks to immediately overwhelm. The interior is pivoted on a central staircase within a bright and airy, highly glazed stairwell. At present the white walls are a blank canvas – although at night they are animated by mood-controlled wall lights – but in time they could easily take colourful decorative or artistic elements for increased impact. Either side of the stairs are functional rooms. On the ground floor is a garage and plant room, on the first floor above, a playroom/study/office. The bedrooms are all situated on the lower floors: simple, well lit rooms with built-in storage and en suite bath/wet rooms. The master bedroom on the third level is large, extending the full depth of the house with a dressing room/walk-in wardrobe forming a partial rear wall of the bedroom and a bathroom and separate toilet beyond it. All the services have been hidden within the walls, easily accessible through discrete panels. With such a strong vertical emphasis and requirement to ascend to the principal reception spaces, the design has incorporated a lift shaft, although currently it is subdivided into storage spaces; nonetheless, the design is future proofed for when a lift might become advantageous. The main living spaces are situated within the ‘eye box’ which is reached at the top of the staircase which itself terminates in a galley walkway (off which, to the left hand side, are a toilet, utility room and an outdoor terrace). The principal areas across the walkway are dramatic and self assured spaces. 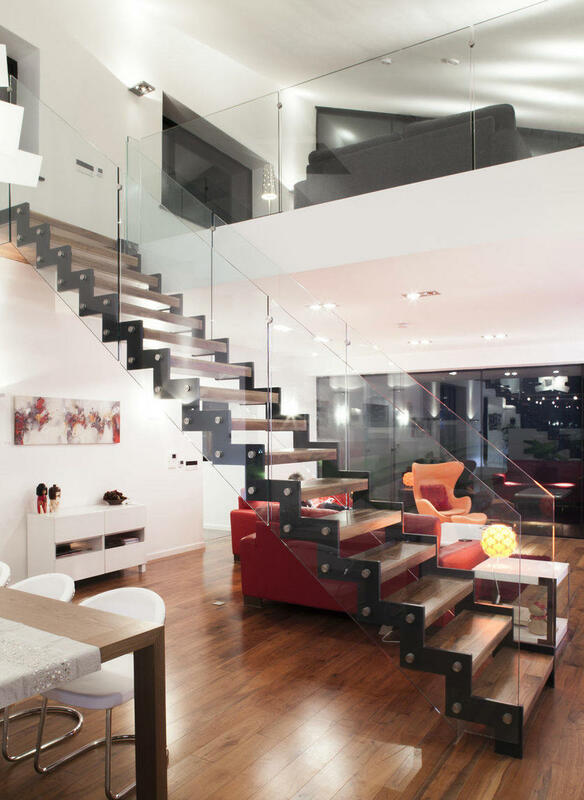 An open-plan lounge is bounded by a curtain wall of glass on one side and an elegant glazed staircase on the other, which rises to a mezzanine level. 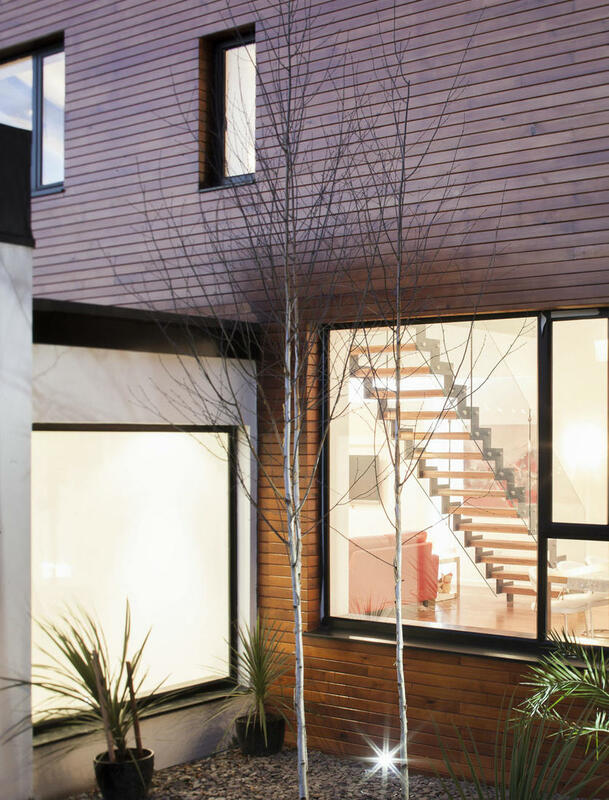 Beyond the staircase is a dining area and steps which lead to an open-plan, contemporary kitchen with a small glazed sitting area off to one side, a sun-trap on the southern aspect. The kitchen and sun-room connect internal and external ‘worlds’ effectively. Highly glazed, they give views to the rear of the site which is pleasantly wooded with mature trees and a garden plot, partially paved, which will eventually become a semi-formal garden space with raised water features to contrast with the woodland. This has all the makings of a calm, distinctive and chic enclosed garden. In addition, it affords snatched views from the rear through the central section of the house to the view to the front. 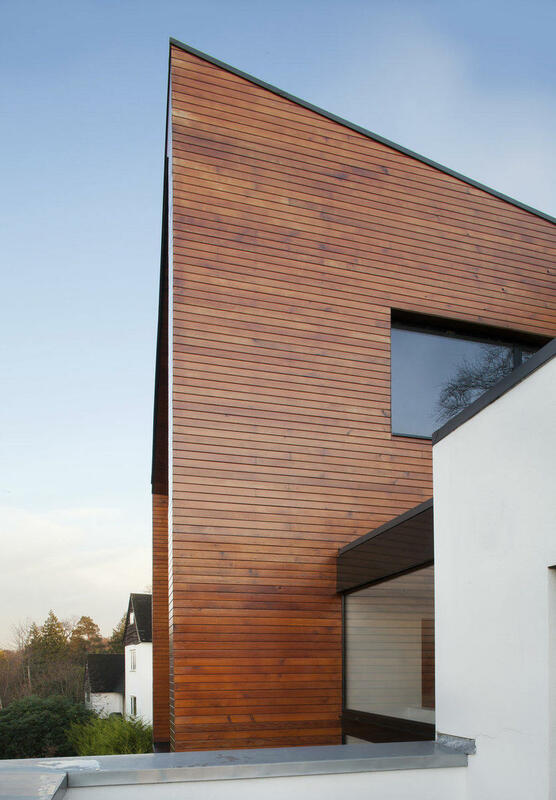 The view of the roof of the ‘eye box’ side of the house is also, in itself, intriguing: the roof is angled gently at four different points to create a subtly unusual shape, with raised seams in the light membrane both channeling water effectively and introducing surface pattern. It is, however, the mezzanine floor which is the main triumph of the structure. 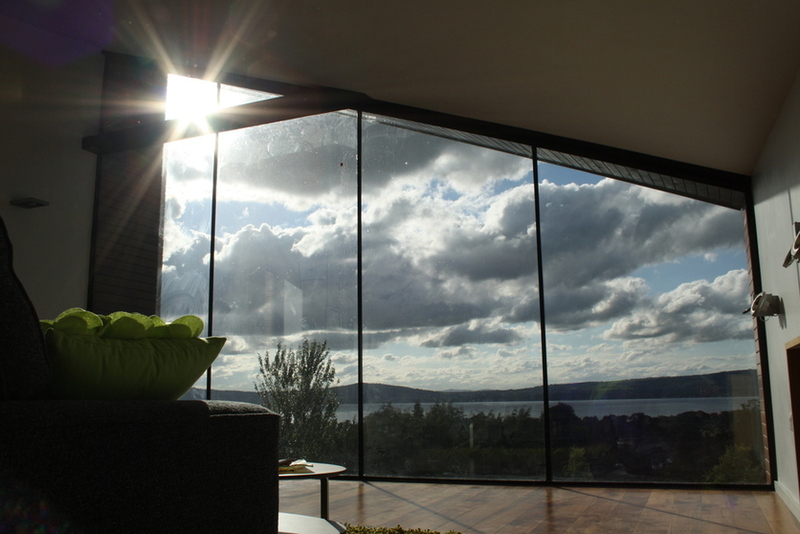 With a curtain wall of glass, the views from this floating room are unparalleled: notions of an eyrie or an air traffic control tower come to mind, especially as the planes going in and out of Belfast City Airport frequently pass by. This is an elegant entertaining space as well as a viewing platform – it could be Hollywood, California (think a Pierre Koenig Case Study House) as much as Holywood, Co. Down. There are various precedents for treetop houses elsewhere, including in Ireland – such as Scott Tallon Walker’s well-known, dramatic Goulding Summer House in Co. Wicklow (1970-3). 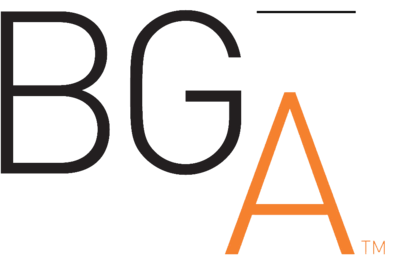 This BGA Architects’ house, which combines the needs of a family home with the drama of distinctive spaces which take full advantage of special vistas, deserves its place in the story of such bold and rewarding endeavours.